Now that our nation’s parks are finally reopening, CycleTrader believes that now is the perfect time to get out and appreciate as many of these national treasures as possible! The Trace begins in Dover, Tennessee, about 1.5 hours northwest of Nashville. Start off heading south on Highway 79. From there, look for signs for Land Between the Lakes (LBL). Follow those signs, they will direct you to a road called "The Trace." Simply take this road north all the way up to the end in Grand Rivers, KY. The Trace is full of things to stop and see, so take it slow and enjoy the ride. You could easily spend an entire day on this 48 mile stretch of heaven. Starting at the southern end of beautiful Land Between the Lakes, this ride offers plenty of places along the way to stop, stretch your legs, and appreciate the scenery. Overall the ride offers equal parts of views of wooded stretches and open vistas. 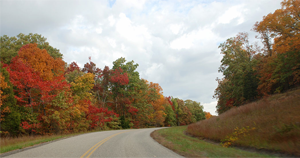 The road through the trace is a well-maintained two-lane, blacktop with nice curves and gently rolling hills. There’s also The Homeplace, a real working 1850’s settlement that you can tour for only $5, as well as free-roaming elk and bison ranges, fresh springs, clear lakes views and more. There’s even a planetarium, so be sure to check the schedule before your ride and you might get to feast your eyes on even more than you originally hoped for! And don’t forget all the campgrounds! There’s Piney Campground, Ginger Bay, Colson Hollow and Brandon Springs, just to name a few. Be sure to see Fort Donelson Civil War battlefield in Dover before or after your ride. There’s also a Dover Cycle & ATV right in Dover, just in case you need to gear up before your trip. Once you arrive in Grand Rivers,, be sure to look for Patti's 1880's Settlement, a great place to eat lunch or dinner before your return ride south!